What is the best approach for resolving differences over the Iranian nuclear programme and preventing a conflict? How would a conflict possibly unravel given Iranian military, asymmetric and missile capabilities? What does a military conflict over Iran mean for international order and India in particular? 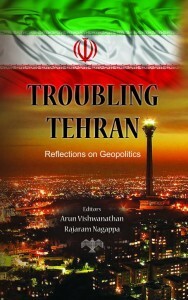 These are some of the questions that the book, Troubling Tehran: Reflections on Geopolitics analyses and seeks answers to. The Iranian nuclear programme is a complex subject plagued by fundamental differences on how best to resolve it. While some advocate diplomacy and economic sanctions as a way forward, others push for a military response arguing that pursuing diplomacy provides Iran additional time to achieve a break-out capability. However, military coercion may not yield desired results, given the dispersed nature of Iranian nuclear facilities. A strike in fact is likely to accelerate Iranian nuclear weaponisation programme. The recent sanctioning of Iran’s oil sector adds to the regime’s cup of woes which is already overflowing due to a host of economic problems. However, the jury is still out on the question of whether sanctions would spark public disaffection against the regime. The implications of a military conflict involving Iran are serious for Asia, particularly India. About 85 percent of Iranian oil exports are eastward bound. Dependence on crude and natural gas imports from the Middle East and North Africa region including Iran poses a dilemma for Indian policy makers. New Delhi thus needs to strike a fine balance while basing its policy on realpolitik and national interest. Arun Vishwanathan is Assistant Professor, International Strategic and Security Studies Programme, National Institute of Advanced Studies, Bangalore. Rajaram Nagappa is Head, International Strategic and Security Studies Programme, National Institute of Advanced Studies, Bangalore.